Michigan's Republican governor has signed bitterly contested "right-to-work" legislation limiting the power of unions, just hours after two final bills passed in the legislature. Michigan's governor has signed bitterly contested "right-to-work" legislation limiting the power of unions, just hours after it passed in the state legislature. Unswayed by Democrats' pleas and thousands of protesters inside and outside the state capitol, the Michigan legislature approved two final bills Tuesday, sending them on to Republican Gov. Rick Snyder. One dealt with private sector workers, the other with government employees. Both measures cleared the Senate last week. Snyder had been expected to sign them into law as early as Wednesday, but he instead signed off Tuesday evening. Michigan becomes the 24th state with right-to-work laws, which ban requirements that non-union employees pay unions for negotiating contracts and other services. According to the Lansing State Journal, the new laws are expected to be in effect as of April 1. Supporters say they will give workers more choice and boost economic growth, but critics say the real intent is to weaken organized labour by bleeding unions of money needed to bargain effectively with management. Protesters in the public gallery chanted "Shame on you!" as the measures were approved. Union backers clogged the hallways and grounds of the legislature shouting, "No justice, no peace." Bob King, president of the United Auto Workers, said he thought things like right-to-work legislation "are waking the sleeping giant." "I think that workers and working families are tired of losing. They want a fair share of the prosperity of this state and this country, and I think that's going to help build the union movement," he said. 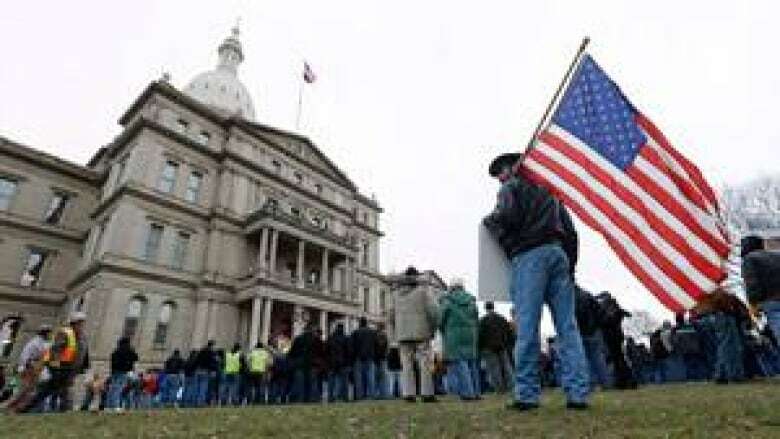 Canadian Auto Workers president Ken Lewenza said he would join American union activists protesting in Lansing. "I'm disappointed because Gov. Snyder, when he campaigned for governor, said he would not introduce right-to-work legislation; it wasn't part of his campaign," Lewenza told CBC News. "But following the U.S. election, where Michiganders voted for Barack Obama, this is simply retaliation, that if you vote outside the Republican Party in the state of Michigan, there are consequences that will be paid," he said. Mark Meldrum, a Windsor, Ont.-based economist and former professor at the University of Windsor, said he doesn't think established businesses will move from Canada to Michigan because of the legislation. "I’m not too concerned about companies pulling up stakes and leaving here because you’re leaving a lot when you leave here. You’re leaving great infrastructure and great health care," Meldrum said. "But if you’re starting new, if you’re going to set up and serve the auto industry, you have a choice." Meldrum also said there is a downside to being in a union. "You have a right to work without joining a union," he said. "When you’re part of the union, you don’t get merit pay. There’s no motivation for you to be any better than anyone else. You end up dwindling down to the lowest common denominator and you end up working at that level." Passage of the Workplace Fairness and Equity Act in Michigan, a cradle of organized labour, gives the right-to-work movement its strongest foothold yet in the Rust Belt, where the 2010 election and Tea Party movement produced assertive Republican majorities. "Michigan is the state that symbolizes organized labour in this country. It is the birthplace of the mighty United Auto Workers union, prides itself on saying that the middle class was built in the state by powerful and strong unions," CBC Washington correspondent Susan Bonner reported. "On the other hand, the Republican state lawmakers who are pushing this through argue that Michigan has a problem, a high unemployment problem, it's not recovering as quickly as other states from the 2008 recession, and that these laws will make it easier to attract businesses," Bonner said. An earlier version of this story said one bill dealt with public sector workers and the other with government employees. It should have said one dealt with private sector workers and the other with government employees.